We tomorrow the packers/movers come so service here may intermittent for the next while. I have finished organising (I think) and now my evil plans need to fall into place. One thing we will be doing on our journey South is further exploration of Southern Rock Art sites. Every trip to the South we try and take in one site and this time we’ve picked Frenchman’s Gully because of ease of access (I hope). I had wanted to see Weka Pass but its a bit of a trek with the kids. Any how I am hoping to see the bird men in person rather than on my old Sanitarium glasses. Looking at that I wonder if there is any peanut butter jar influence on Bill Hammond. So I’ve got out my reference books and the McDougall Art Gallery publication on the Theo Schoon Interpretations. If any one has other suggestions of easily accessible sites not far from State Highway One – please comment. 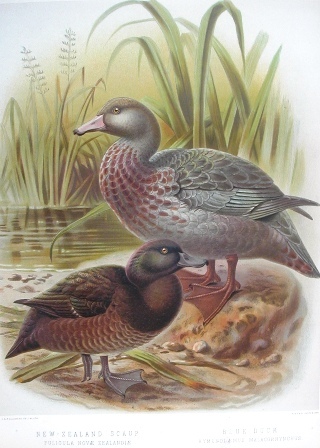 Today in a fit of nostalgia I have been thinking about Blue Ducks (or Whio) and a small part of my life spent following them (and their trackers) around mountain rivers. 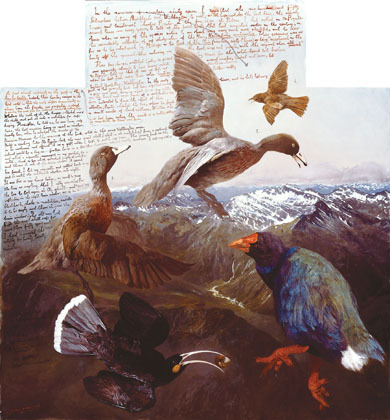 Birds seem to feature largely in NZ art, or is that just me…? Of course Dr Buller was one of the first documentors and I grew up with his book of birds, although J. G. Keulemans was the illustrator. There was even a play “Dr Buller’s Birds“. Its a pity Buller collected skins but I guess it means we do have “examples” of extinct species. More contemporaily, I can think of Raymond Ching, Don Binney and Bill Hammond who have used birds rather centrally to their work. What does it all mean? However more interesting is a discussion of the significance of the birds here with reference to Binney and Buller. So are we “kiwis” doomed to be earth-bound, only dreaming of flight? So an article was sent to me yesterday about the death of Angus Fairhurst. I wasn’t sure whether to write about it, as this is art and my life and he wasn’t really on my radar – the gorilla guy right? Well I read some more and I wonder why his work, while highly regarded, he had not reached the level of fame and fortune that other ‘Young British Artists’ achieved? Maybe over-shadowed by the extravagance of Hirst for example – an ‘art rock star’? I liked this photo I found by Maia Norman, from the In-A-Gadda-Da-Vida exhibition at the Tate in 2004 (what a great name for a show!). 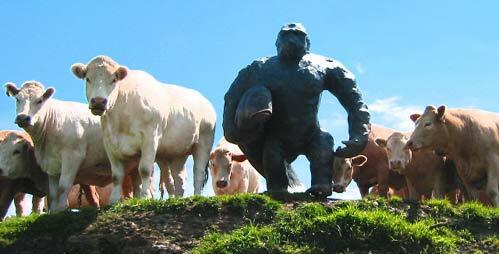 Which also got me wondering about Hirst’s farm – well there are cows which is something. So does the Gibbs farm have livestock? Do the artworks ‘scare the horses’? 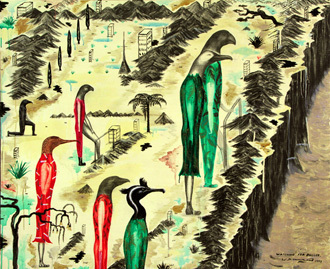 Fairhurst is described as intense, self-deprecating, perceptive but also witty and engaging. From a brief scan his work seems ‘weightier’ than his contemporaries. 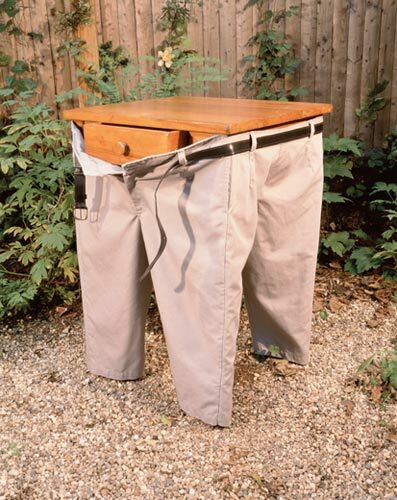 Really I don’t know…these things are tragic …whatever the reason. So, are people like Hirst and Koons the rock/movie stars of the art world? Well maybe some clues about this elevation of status in the art world can be found in Guest of Cindy Sherman screening around the country just now. Sounds worth seeing (although Wellingtonians have missed out, as it is showing as I am writing this). There have been suggestions of a similar project in NZ to that of Paul H-O. It would be short – but funny. Although I have only dipped my toe into shallow puddle that is the art scene here, I’ve already heard some recent stories of excess. Of course my mind wanders incessantly (you get that as you are scrubbing s*%t off nappies) and if artists are rock stars, what about rock star artists? For your amusement I found this review of celebrity artists which gives a grade – funny in itself. Personally I might have given Bowie more than a B+ (didn’t he go to art school by the way?) but I was impressed by Marilyn Manson’s abilities with water colours (I’m not kidding). And it might have been nice to see more works other than paintings. David Byrne’s being the exception of course – and who I believe is Cindy Sherman’s current partner. Music and art are often intertwined I guess. I just watched the Clairmont “Profiles” video again yesterday and there were the images of a (painted) speaker pumping away and records playing, Hendrix etc. And at the recent Hammond exhibition wasn’t there a ‘soundtrack’ you could listen to while viewing the paintings? So what is the ‘soundtrack’ to contemporary art? And a chocie fish to whoever can work out what the title of this entry has to do with the content – apart from the obvious. Firstly a second-hand review. Someoneiknow took a few hours off work to go to the Bill Hammond exhibition “Jingle Jangle Morning”at the City Gallery on Wednesday. It must have been good because he has talked about it A LOT and spent 2+ hours there without even realising what the time was. It closes 10 February so I doubt whether I”ll get there (Grrrrrr).